Walt Gonske was born and raised in New Jersey. After graduating from the Newark School of Fine Arts, he studied with the famous illustrator, Frank Reilly, and at the Art Students League in New York. He was a successful commercial illustrator before deciding to move to Taos, New Mexico, in 1972, to pursue a career in fine art. Gonske’s plein-air paintings are a direct result of his emotional response to his subject. 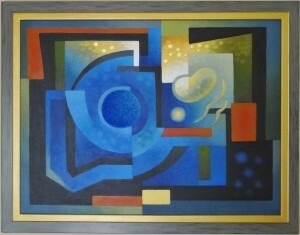 His technique is direct and bold, resulting in a dynamic, brilliant composition infused with intense color and light. Gonske interprets nature through his paintings. Gonske has received numerous awards for his paintings, including first prize from the Southwestern Watercolor Society, the gold and silver medals for oil painting from the National Academy of Western Art, and the bronze medal for drawing from that organization. His paintings are included in museums around the country, including the Eiteljorg Museum of American Indian and Western Art, the Thomas Gilcrease Institute of American History and Art, and the National Cowboy Hall of Fame and Western Heritage Center.